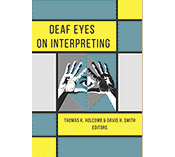 This is the 4th weekly installment from the 20 chapters in the new book, Deaf Eyes on Interpreting, edited by Thomas K. Holcomb and David H. Smith, which is scheduled to be released in June by Gallaudet University Press. This chapter, American Sign Language Interpreting in a Mainstreamed College Setting: Performance Quality and Its Impact on Classroom Participation Equity, has three co-authors John Pirone, Jonathan Henner, and Wyatte C. Hall. As John Pirone describes in the video clip above, their research shows it is an illusion to think that providing an ASL interpreter in mainstreamed college classes provides equity for the Deaf students. 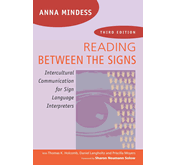 He enumerates several areas of concern regarding interpreters’ skills and actions, including lack of ASL fluency, less than adequate ASL receptive skills, intercultural incompetency and lack of professionalism. In the full chapter, the co-authors propose solutions to this troubling state of affairs for Deaf students in interpreted college classrooms. Posted in Deaf Education, Deaf Eyes on Interpreting, Deaf/hearing cultural differences, New book, New book, Deaf Eyes on Interpreting, videos from book contributors and tagged american sign language, ASL, ASL interpreters, Deaf community, Deaf Culture, Deaf Education, Deaf Eyes on Interpreting, Interpreted college classes, interpreters, John Pirone, Jonathan Henner, Wyatte C. Hall. Bookmark the permalink. 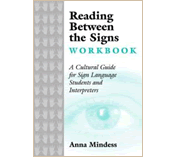 This is the second weekly installment featuring highlights from the 20 chapters in the new book, Deaf Eyes on Interpreting, edited by Thomas K. Holcomb and David H. Smith which is scheduled to be released in June by Gallaudet University Press. In this chapter, Thomas K. Holcomb coins a new term, DEAM, which is a play on three English words: Deaf, Dream, and Team. He discusses how both interpreters and Deaf individuals often leave interpreted sessions feeling less than satisfied, even with the best interpreters involved. He proposes that the current standard practice is not adequate for Deaf people to fully understand the interpreted message and participate well in mostly hearing groups and suggests several ASL discourse techniques that interpreters can incorporate while interpreting lectures by hearing presenters. He also questions several long traditions in the field of interpreting, such as the 20-minute switch rule. Tom encourages both Deaf people and interpreters to explore these issues in depth to come up with solutions that will result in better experiences for both Deaf people and interpreters. 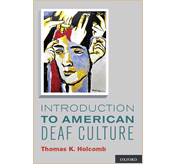 Posted in Deaf Culture, Deaf Eyes on Interpreting, New book, New book, Deaf Eyes on Interpreting, videos from book contributors and tagged american sign language, ASL, Deaf Culture, Deaf Eyes on Interpreting, Gallaudet Press, Thomas K. Holcomb. Bookmark the permalink.